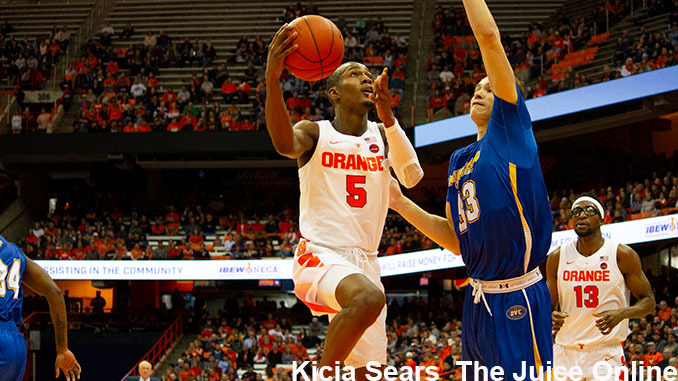 Syracuse guard Jalen Carey goes up for a layup. Mandatory Photo Credit: Kicia Sears, The Juice Online. Item: As we wrote around this time in 2017, the ACC was looking to cap off the double-double college sports calendar sweep with Clemson and North Carolina football-basketball national championships. Following Clemson’s second football title in three seasons in convincing fashion against Alabama on Jan. 7 and Virginia’s thrilling overtime win over Texas Tech for the NCAA basketball title April 8, the ACC has completed the sweep for a conference record-tying third time, marking the 13th occasion a league has captured both championships in the same school year. It also means that Syracuse resides in the toughest conference in which to compete for national championships in those two sports. How far away is Syracuse from winning a second national championship in football and basketball? Closer in basketball than football, as evidenced by SU’s out-of-nowhere Final Four appearances in 2013 and 2016 as both Big East and ACC members. But football is gaining some ground in the last three seasons in what is otherwise an apples-to-Oranges comparison. The margin for error is virtually zero defeats over 13 football games (with the added league championship game) before the College Football Playoff semifinals to compete in the CFP title game, which includes the grind of eight league games plus Notre Dame every few seasons. It makes the annual path to the football trophy most onerous. ACC football has won more national football titles than any other conference since 2013 (three of the last six), and, of course, Clemson is not going anywhere as long as Dabo Swinney is running the program, even as Syracuse is the one team that has given the Tigers fits the last two years, including its only regular season defeat in 2017. A championship football season has to include the confluence of so many variables besides a great team of stellar athletes, including few injuries, scheduling breaks, and a lucky bounce or two from the football and a call or two from the officials. The top of the ACC basketball power rankings is now permanently log-jammed with a trio – Duke, North Carolina and Virginia, programs also not going anywhere under their current regimes, and all now having won national titles dating back to 2015. If Jim Boeheim can get back to a sixth Final Four to contend for a national title as early as next season or at some point before he eventually decides to retire, he will set a record that is truly likely never to be broken. He will move past a tie with the great Dean Smith (11 Final Fours between 1967-1997) by coaching a team to the Final Four in five different decades with the 2020s joining 1987, 1996, 2003, and 2013/2016 (and, he was an assistant on the 1975 Final Four team, marking an incredible six decades).